Watchmakers Edox, based in the Swiss Jura, celebrate their 125th anniversary in 2009 with an horological story studded with success and with inventions some of which remain unrivalled even to this day. 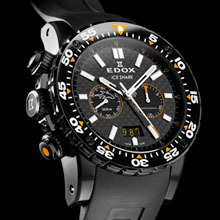 Edox, with an image inextricably linked with the nautical world, became partner and official timekeeper for the spectacular class-1 boat racing event, the Class-1 Powerboat World Championships. Their name is also featured on the 44-foot yacht, Sea Dubai, which is signed up for the RC44 championships, the international regattas of which serve as qualifying events for the next America’s Cup. The latest addition to the Edox family, born of their Dynamism line, is the new Class-1 Ice Shark, a decidedly technical and robust watch with clear, crisp styling. The watch is fitted with a chronograph movement ingeniously pivoted through an angle of 180 degrees and housed in a sturdy PVD-coated steel case. The control buttons, with an orange epoxy trim, are located on the left, while the limited-edition number is engraved on the right side. Surrounded by a magnificent black ceramic bezel, the numberals and markers stand out in white and orange. The black dial provides an excellent contrast with the sub-counters which are also outlined in orange and one of which proudly features the silhouette of a shark. The most demanding of sportsmen will be delighted with the black or orange natural rubber strap which is extremely comfortable to wear. Assembled by hand in Edox’s workshops, the Class-1 Ice Shark is water-resistant to the dizzying depth of 1,000 metres and production is limited to 1,000 pieces worldwide. Edox have remained true to their philosophy for 125 years and their goal is to rank among the three foremost Swiss watch brands in their market segment. Their new Class-1 Ice Shark, a combination of precision and dynamism with a decidedly maritime character, certainly provides the Jura-based watchmakers with the means to achieve such a goal.